Ever since I got back from my recent California trip I've been craving sweets, Flan to be specific. I blame it to my friend Junarta who is very well known to eating all kinds of sweets and desserts. I had a chance to stop by and get one on Friday after getting my hair done. The salon that I usually go to has a Filipino restaurant at the same complex. So whenever I'm there, I stop by for some desserts and pastries. Two days later on Sunday, I decided to play some open gym volleyball and the gang decided to eat after. Place of choice? Kawali Grill at Columbia City. At first I was just gonna get my craving fix but for lured into getting some Arroz Caldo (Congee) before hand. I thought everybody was full after all the food we ate but my friend Vka asked me to order some flan. Best Flan ever!!! 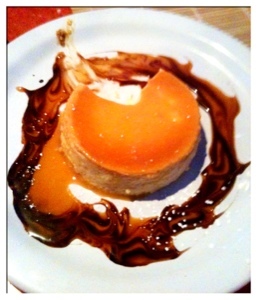 They finished it with some Caramel and Chocolate syrup around it that gives the flan extra extra flavor. I can say I'm done with my cravings for now but I'm pretty sure this won't take that long for me to get me another round of it.